Purchase of up to 6 pool and sports passes are available with this property. Please see bottom of the listing for details. IMPORTANT 2019 NOTE: due to new Massachusetts legislation, we are require to collect total of 14.45% state and local lodging taxes for bookings starting from July 1 2019. You will see these taxes added with a final quote after inquiry. 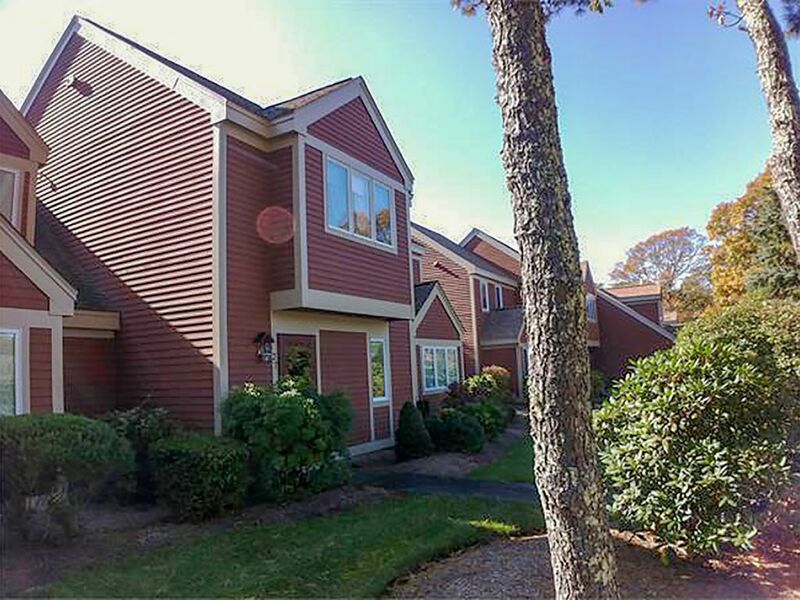 This is a clean, family-friendly two-floor, 2 bedroom, 1.5 bath townhouse located in private Billington Village of Ocean Edge Resort in Brewster, MA, and within a short walk to Ocean Edge’s Arbor pool and Linx Tavern. The resort has several restaurants and is connected to the Cape Cod Rail Trail for cyclists. Captains Golf Course (public) and Brewster public bay and pond beaches are 2 miles away. Please note that for Brewster public beaches you would need to buy parking passes at Town Hall. In addition, there are many other activities and amenities in the area, including shopping, groceries, hiking, including in beautiful NIckerson park. The first floor features living/dining room with a large convertible sofa bed, love seat, dining room table with chairs, flat-screen TV with cable programming, Blueray/DVD, WiFi, half bathroom and a full kitchen with all necessary appliances - microwave, coffee-maker, toaster, electric kettle, convection toaster oven, dishwasher, refrigerator. Kitchen is supplied with all necessary kitchenware and utensils. Outside the living room, through a large sliding glass door is a private patio with wooded view; features patio table, umbrella, chairs and a gas grill. The second floor has a spacious master bedroom with a large closet, queen-sized bed and a dresser. The master bedroom also has a sliding glass door that overlooks the patio below and produces a wonderful breeze. Also on the 2nd floor is the second bedroom with two twin-sized beds, dresser, nightstand and a closet. The 2nd-floor bathroom has a vanity and adjacent room with a shower/tub and exhaust fan. Washer and dryer are located on the 2nd floor directly outside the bathroom. The unit has everything that is necessary for vacation. We provide blankets, pillows for all the beds, bathroom and kitchen supplies, except for personal hygiene items. Bed linens and bath towels are available. Our goal is to make your stay as comfortable and worry less as possible! We ask our guests to run linens and towels through washer and dryer when checking out. And of course guests are welcome to bring their own linens/towels if they choose to. With this rental, upon arrival and for additional fee, you can choose to purchase up to 6 passes to access many of the amenities offered by Ocean Edge Health Club, including Fletcher Indoor Pool, Fletcher Outdoor Pool, Fletcher zero entry toddler pool, indoor and outdoor hot tubs, Arbor outdoor pool and Arbor Wading Pool, fitness center, tennis courts, kids activities, outdoor pool movie nights, beach bonfire and other events. Please note that these passes will not provide access to Ocean Edge Golf as well as their beach. Children 3 and under no charge with paying Adult. Guests can buy up to 6 pool passes to use Ocean Edge Resort's pool and health facilities. See listing description for details. I enjoyed the stay. Property was great. Only thing I would change is to be able to leave the bed linens and towels to be laundered for us. We had an early flight out of Boston therefore we had to get up extremely early to get that done before heading out. The grounds of the property were very well maintained. We spent the last week at Alex's condo in Brewster. Loved every minute of our stay. Clean, organized, welcoming, and friendly environment. Will definitely stay again. Great condo,Very clean, owners receptive to a small issue we had with AC. Loved our stay at the Ocean Edge Resort in Brewster. Brewster is lovely, a bit off the beaten path as far as traffic goes, yet in the middle of the cape for easy access to all beaches. Wonderful. Charming, comfortable and clean. Owners were fabulous to work with. Thank you. Thank you!!! Wonderful experience overall. Wonderful clean rental in Brewster.Alex was very understanding when a conference call had to be done and allowed a 12 noon check out. It was a pleasure dealing with the home owners.Cleaners just need to remove spider webs and bedding needs an upgrade. The Condo had everything we needed. The location was great for its proximity the Cape Cod Rail Trail, beaches and restaurants.